Ancillary bag fees are the necessary evil of modern air travel. Although aeroplane tickets have gotten notably cheaper, airlines depend more and more on those extra fees to turn a profit. And believe us, they do profit: according to a survey conducted across 73 low-cost airlines, the total revenue of ancillary fees amounted to $47 billion. However, this seems to be a win-win for everyone: passengers are happy with affordable tickets, and airlines sitting comfortably atop a pile of money. But what if you want to go on a month-long work trip or a month-long sabbatical and don’t want to pay for checked baggage? Keep reading to find out how you can fit everything inside a carry on luggage! First things first: before you start packing your carry on bag, you need to know precisely what is allowed. According to IATA, an acceptable carry on baggage can be no larger than 56 cm (22”) in length, 45 cm (18”) in width and 25 cm (10”) in depth, including all protrusions (wheels, handles, etc.). Of course, with so many carriers around, you can bet not all of them adhere to the same standard. Therefore, it pays to do your research when booking an air ticket. The good news is that, in most cases, you are entitled to bring a free personal item (a backpack, purse, tote bag) aboard. In theory, this shouldn’t be heavier than 8kg. However, nobody’s ever going to weigh it, so go ahead and fill it up to your heart’s content. Just play it cool and don’t heave audibly as you’re lugging your 100kg backpack in front of security. On a final note, opt for a four-wheeled soft bag. We know that hard case suitcases look cool and make you feel like a hard-boiled detective, but they just aren’t as flexible. As for the 4-wheel factor, it’s a life saver when it comes to manoeuvring narrow streets and airport terminals. Having a list of all the things you need to is a godsend, especially if you’re packing a couple of hours before your flight because spent all your time binge-watching stuff on Netflix instead of getting prepared for your trip. Planning is fun, and it’s what functioning adults do. It’s not that we don’t trust you, but we have prepared a list of the absolute essentials, so you don’t have to do it. Winter is usually the hardest to pack for, therefore our list includes some winter clothing. 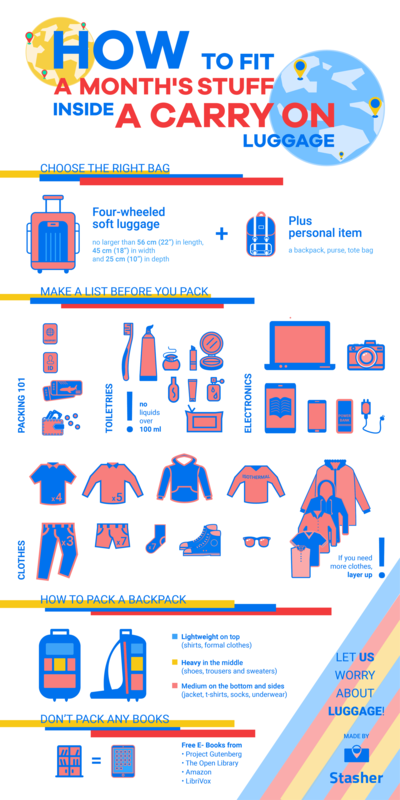 You can fit all of that between your carry on and personal bag, and it can last you up to a month (provided you have access to a washing machine). Click here for a full-screen version. Feel free to share or embed this infographic! If you need a jacket, wear it. Don’t pack it in your bag! If you are bringing a second pair of bulky shoes (like trainers or boots), wear them on board and pack the lighter pair to save space. Feel free to copy, alter and experiment with this list. You know what you need better than we do, but at least by using that you can make sure that you didn’t forget anything important. Store heavy stuff first (like shoes, trousers and sweaters) and place them in the middle of your bag. Roll fold and add t-shirts, socks and underwear on the sides. Finally, store shirts and any formal clothes on top so they don’t wrinkle. Folding is an easy-to-learn, hard-to-master technique. 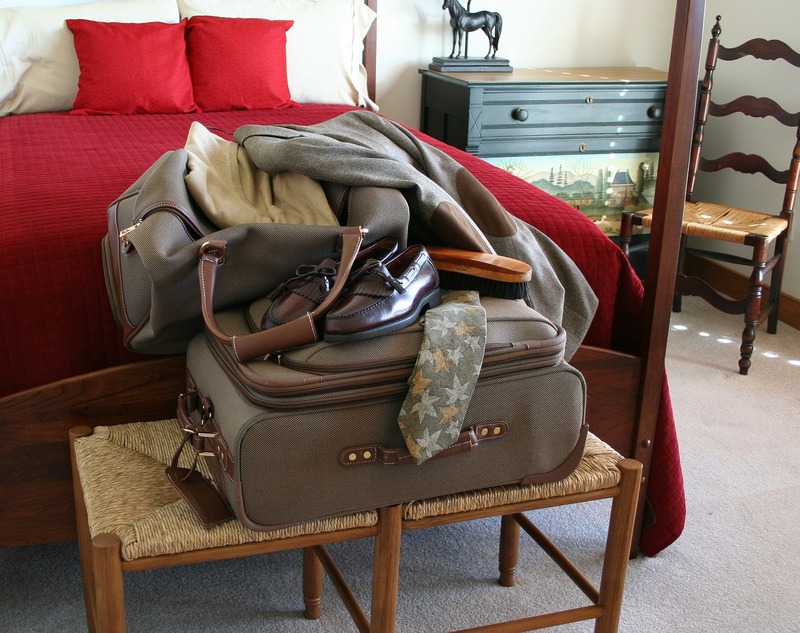 When it comes to fitting as many clothing items as possible in your carry on bag, proper folding is half the battle. There are many ways to go about it, and the rolling fold is one of the oldest tricks in the book. When you roll your clothes instead of simply folding them, you drastically decrease the surface used per item of clothing. This is especially effective with t-shirts, sweatshirts and trousers but keep in mind that it can easily wrinkle your clothes. Therefore, if you’re travelling for work, we suggest packing your formal garments on the top. Since you are not checking any pieces of baggage, you and your carry on must undergo a security check. Make sure that you carry no liquids over 100ml (toothpaste counts as well) and put all of them inside a small bag. If you are packing a bottle of perfume, make sure it is under the limit to avoid nasty surprises. An excellent way to never worry about this is to always opt for the small version of your favourite fragrance. Also, don’t bother getting shampoo or towels. Whether you’re staying on an Airbnb or a hotel, in 99.9% of cases, those will be provided for you. Unless you stay in a hostel, in which case always bring a towel. Worst case scenario, you buy some shampoo and body wash when you arrive. Thankfully, these products are cheap all over the world! The list we prepared for you (you’re welcome) is about stuff you can fit in your carry on. If you need more clothes, you can always layer up! Especially when it comes to items such as sweaters and coats, this can save your life. Don’t worry about matching a blazer with trainers; nobody cares about how you’re dressed in an airport. If you are travelling with an extra pair of shoes, store your socks and jewellery inside them. Seven pairs of socks can pile up and this trick will save you a considerable amount of storage space. Some carry on bags even have special compartments for underwear and socks, but the less you cram in there, the better. All electronics and chargers can be added in your personal bag, along with your toiletries and (perhaps) some extra pieces of clothing. Don’t underestimate the capacity of your backpack or handbag. Besides, your tablet and laptop will have to go through security, so they must be on you at all times. We know that there is no better companion for travelling than a good book. However, books tend to take up quite a lot of valuable storage. A better solution would be to load up as many of them as you want on your tablet or Kindle device and read them from there. Besides, you can also download movies and series from Netflix on mobile devices and make those long, boring layover times fly. Don’t get us wrong, we love the smell of a book ourselves, but when it comes to efficient travel, a 600-page paper brick doesn’t exactly help. Let us worry about luggage! Although you might have packed perfectly, travelling is meant to be enjoyed without heavy baggage slowing you down. 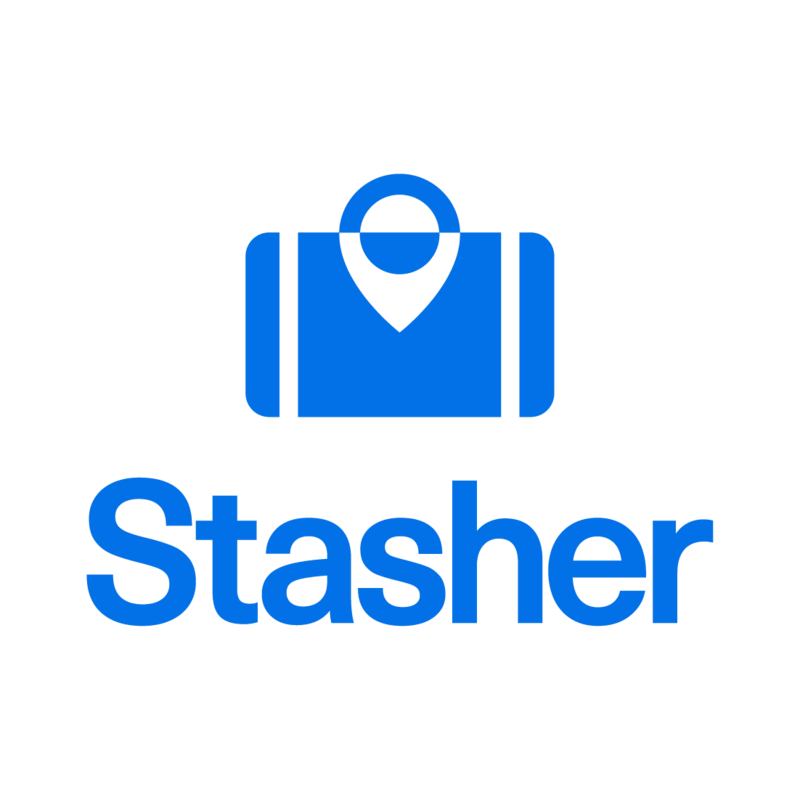 That’s where Stasher comes in! If you ever find yourself dragging your luggage around town waiting for that late flight (or check-in), don’t fret! Use our map to find a StashPoint near you, book it online and enjoy your trip hands-free!